Kiting between Hood River and La Vantana ? I know it's a little hard to believe looking at the world map. But there is NO KITING between HR and LV. Sherman island is definitely the place to stop by. Better wind than hood river in my opinion. McLovin, there is tons of great kiting between hood river and LaVentana. The bay area near San Fransisco and Oakland is great too. 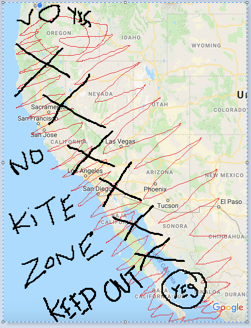 yes it is a common misconception, but there is really no feasible spot for kiteboarding between HR and LV. I am not a physicist, but it has something to do with the coriolis effect and it is just not possible. I've tried in places where there is enough room to run your lines and pump a kite, but i've lost 3 perfectly good kites, sadly. I won't be trying a 4th time. You have been warned. Depends on the month, and your luck. I drive south the day after Christmas every year, and it's pretty dark and cold through the states. For me, the magic pops up just as a come over that last rise in the desert east of Vizcaino... and coming down to your first warm glimpse of the Sea of Cortez near Santa Rosalia. Whitecaps and a nice solo rigging beach. During one of my drives there was an epic El Norte blowing across the entire Baja Peninsula. But I found no windsurfers or kitesurfers at any other Baja locations on the drive down. And not knowing the language, reefs, currents, no cell reception, kiting alone, etc...etc.. I did not feel the risk was worth it. When I could just use the time to get to LV sooner and start kiting there. I say just enjoy the epic drive which is super amazing especially the first time down. You can find a plethora of route information online, but I would add that after 7 round trip I finally discovered Hwy 5 down the east shore of the Baja Penninsula. If you're not driving a Prius, or not towing something heavy, it's a much more peaceful and beautiful ride. And the Mexicali East border crossing is a breeze. Hwy #5 has an hour of gravel which turns some away from this option. Every summer I road trip to HR from Southern Arizona. I camp and kite along the way. My way home looks like this. From HR to South Oregon coast-Whiskey Run, Floras Lake or Pistol River. Then to the Bay Area-Waddell Creek, Sherman Island or Crissy Field. Then Jalama Beach in Santa Barbra County. Not sure when your traveling, but these places work for me. Spaced out so if you leave early you can enjoy a session that afternoon. If you take the ferry from Los Mochiis to La Paz, hit San Carlos Sonora on the mainland. Mon Sep 17, 18 7:04 pm Go for it. I drive down in November and Back in April yearly. I kite all the way down and all the way back. On the Sea of Cortez side I kite from San Felipe down - I can't count how many places there are. Just need wind of course. On the Pacific side, there are quite a few spots but you may have spend some time getting there. - Pacific has some pretty good surf too if that's your thing. Above the border on your way down same thing. Water and wind, go for it.